Eltima SWF & FLV Toolbox is an video conversion program that includes Flash Video FLV converter and Adobe Shockwave Flash SWF converter. Eltima SWF & FLV Toolbox can convert individual file or batches of Flash SWF or FLV files into popular image and video formats, such as Projector EXE executable, AVI video, frame-by-frame JPG, GIF or BMP image series, screensave or single animated GIF. SWF & FLV Toolbox features Advanced Projector specialty (Advanced Flash Player) that able to create EXE files out of any SWF or FLV, thus making it possible to watch SWF or FLV movies using handy controls and without installing Flash Player on a PC. Modify Advanced Flash Player caption, icon, cursor, version information, window size and location, expiration date etc. Enter user name and email address, and then click Get your free activation code button. 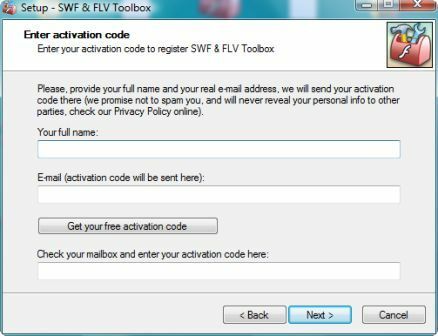 After the confirmation prompt, an email will be sent from “Eltima Software ” with the subject of “SWF Toolbox – Free copy” with a free registration code for the commercial program. Enter the serial number into the activation code text box in the dialog box to complete the installation. Eltima SWF & FLV Toolbox supports 32-bit (x86) Windows 2000, Windows Vista, Windows XP, Windows Server 2003 and Windows Server 2008 officially.